This popular game is known as Checkers in the United States, and Draughts in much of the rest of the world. It is a two-player game played on a board made up of 64 alternately-colored squares, eight to a side. All gameplay occurs on squares of a single color – usually the darker one. 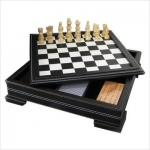 The object is to capture all of your opponents pieces before he captures yours. The first player to capture all of his opponent's pieces is the winner! Checkers is also known under such names as "Damka" (in Israel), "Darma" (in Italy), "das Damenspiel" (in Germany), "La Jeu de Dames" (in France), and "Warcaby" (in Poland). The study of Oriental games indicates that Checkers had a common origin with Pachisi, The Mill, and other board games, but not until relatively recent times has Checkers received the same serious consideration that has been bestowed from ancient times on Chess. In early times, it was fashionable to deprecate Checkers as "Chess for ladies". But Checkers as a game of skill has been rated the equal of Chess by some who have mastered both games. If anyone is desirous of mastering the game and willing to devote a little time to learning its principles, he will have little difficulty in becoming an expert player. In addition, he will find himself amply rewarded for Checkers carries a fascination unequaled by any other game. Checkers is a highly scientific game and every move from start to finish should be made with a purpose in mind. Skill is the fundamental basis of the game and this skill can only be attained by learning these principles and strategies. 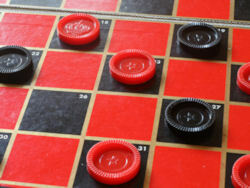 Checkers has remained a family favorite, owing to both its approachability and quick play. It is, in many ways, a great way to introduce children to the joys of abstract board games, and can serve as a stepping-stone to more complex games, such as Chess, or a lifetime pleasure in its own right. Variations include: Giveaway Checkers, Diagonal Checkers, Italian Checkers, Spanish Checkers, German Checkers, Russian Checkers, Continental Checkers, Canadian Checkers, Turkish Checkers, Go-Moku, Fox and Geese, and many more.